Ischemic conditioning maneuvers, when induced either locally in the heart or remotely from the heart, reduce infarct size. However, infarct size reduction can be assessed no earlier than hours after established reperfusion. 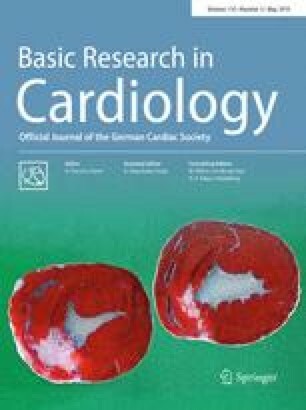 ST-segment elevation and its attenuation might reflect cardioprotection by ischemic conditioning online. Pigs were subjected to regional myocardial ischemia/reperfusion (1 h/3 h). Ischemic conditioning was induced prior to ischemia either locally (preconditioning; IPC; n = 15) or remotely (remote preconditioning; RIPC; n = 21), remotely during ischemia (remote perconditioning; RPER; n = 18), or locally at reperfusion (postconditioning; POCO; n = 9). Pigs without conditioning served as controls (PLA; n = 29). Area at risk and infarct size were measured postmortem, and ST-segment elevation was analyzed in a V2-like electrocardiogram lead. Ischemic conditioning reduced infarct size (PLA 42 ± 11% of area at risk; IPC 18 ± 10%; RIPC 22 ± 12%; RPER 23 ± 12%, POCO 22 ± 11%). With PLA, ST-segment elevation was increased at 5 min ischemia, sustained until 55 min ischemia and further increased at 10 min reperfusion. IPC and RIPC did not impact on ST-segment elevation at 5 min ischemia, but attenuated ST-segment elevation at 55 min ischemia. With RPER, ST-segment elevation was not different from that with PLA at 5 min, but attenuated at 55 min ischemia. POCO abolished the further increase of ST-segment elevation with reperfusion. Cardioprotection by ischemic conditioning is robustly reflected by attenuation of ST-segment elevation online. B. Ibáñez, Madrid, Spain, served as guest editor for the manuscript and was responsible for all editorial decisions, including the selection of reviewers. The policy applies to all manuscripts with authors from the editor’s institution. Georgios Amanakis and Petra Kleinbongard contributed equally to this manuscript. The data of the present manuscript are the subject of G. Amanakis’s MD thesis. We thank M. Neuhäuser, Department of Mathematics and Technology, Koblenz University of Applied Science, Remagen, Germany, for his advice and revision of statistical analyses. GA: acquisition, analysis, and interpretation of data, drafting of manuscript. PK: analysis and interpretation of data, drafting of manuscript. GH: study design, interpretation of data, final revision of manuscript. AS: study design, acquisition, and interpretation of data, drafting of manuscript. The present study was supported by the German Research Foundation (SFB 1116 B08).